But during my experimenting, I did notice that one easy way of successfully retaining the flavour of creaming soda was in jelly form. And I love jelly. It's so wobby and fun and makes cakes look cool. So I forced myself to give up on the macaron idea (for the moment) and adapt it into something just as cute and much, much easier to do - cupcakes! And yes, I've done cupcakes with decorative, non-functional straws in them before with the ginger beer cupcakes, but I can't help myself, it looks so cute! The toppings do make the cupcakes a little too difficult to eat straight out of your hand, so it's definitely better to serve with some spoons. I happened to have these cute little pyrex baking cups which I thought would be appropriate, and they were definitely easier to eat out of compared to the ones I used paper cupcake liners for. So if you have some individual silicone, glass or ceramic baking cups I would definitely recommend you use them for this recipe. The cherry and straw complete the look, I think they would be so great for a kids birthday party. 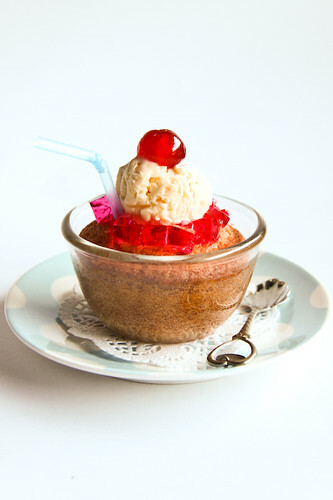 There's not much flavour of the creaming soda in the cupcakes, so you need to heap on lots of that awesome tasting jelly to have with the cake to get that creaming soda taste. 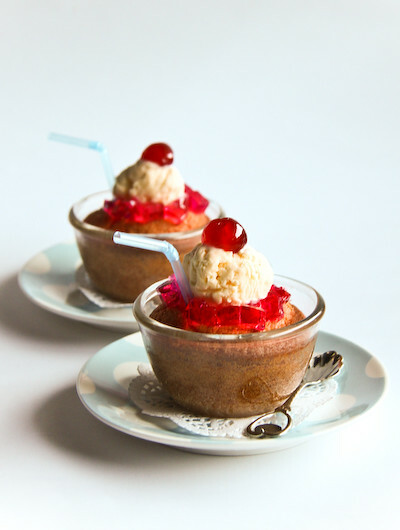 If you can't use ice cream because you want to transport the cakes, just top with some whipped cream instead. To serve: Vanilla ice cream. Place 100ml of creaming soda and the tbsp of caster sugar in a small saucepan and gently bring to the boil. Add powdered gelatine and stir to dissolve completely over the heat. 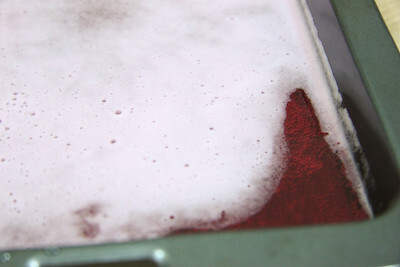 Add the remaining 400ml of creaming soda and pour the mixture into a wide shallow bowl or tin. Place in the fridge and chill until set (2 hours-overnight). Preheat oven to 180 degrees C. Cream butter and sugar with an electric mixer in a large mixing bowl until light and fluffy. Add eggs one at a time, beating well to combine after each addition. Add vanilla essence and food colouring and beat a little more. 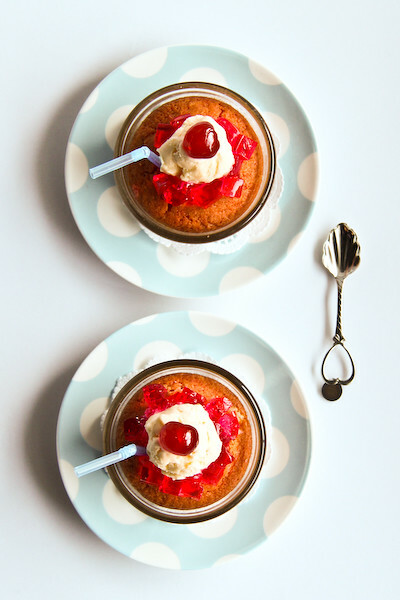 Fold in flour and creaming soda gently with a spatula, then spoon mixture into a lined cupcake tray, or into greased individual baking cups/ramekins. Make sure they are no more than 3/4 full. Bake in oven for 15-20 mins for a regular sized cupcake 20-25 mins for a larger cupcake (as seen in this post). When you are ready to serve the cupcakes, carve a hole in the top of the cupcakes so there is a well to place the jelly in. 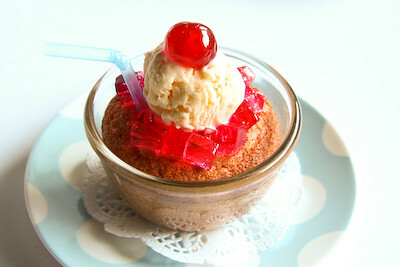 Dice up the jelly and spoon it on top of the cake and top off with a small scoop of ice cream, cherries and a straw. 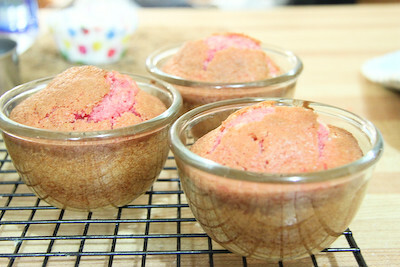 Cupcake and jelly can be stored separately for a couple of days, jelly in the fridge, cupcakes in an airtight container. remind me to force you to bake all my kids birthday cakes for the first 10 years of their lives... this is amazing!! steph your presentations are always so squee and beautiful! Creaming soda jelly!! What a great idea. Miss C loves creaming soda and will be jumping with joy if I make her creaming soda jelly. Love eating cupcakes from a bowl. So comforting. I love creaming sode too! 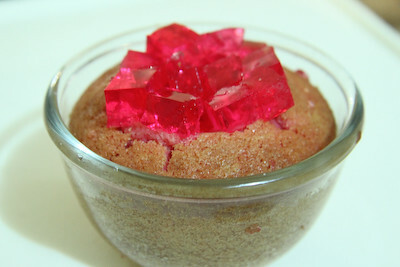 The jelly form sounds delicious- Good work for perservering! My bf adores cream soda and I love the look of these. Way too cute XD. Um, I completely forgot about creamy soda. oops. I cant believe you came up with this recipe. You are a queen in the kitchen. I also can't believe you made jelly, I'm a packet user! I love your cupcakes, extremely...err... suggestive... if you know what i mean... LOL Austin Power would have say, "1960s yeah Baby!!!" i'm super drooling! they look delicious! i've never tried creaming soda... i'll have to find it and make this! I could eat a bowl of creaming soda jelly on its own. But that would mean missing out on the brilliant presentation - well done! these would be so awesome if we ever do that 50's diner themed party!! I haven't had creaming soda in so long but I love it too. Beautiful cupcakes!! The little bit of pink in the cake looks very cool. These cakes should come with a warning "Not for ages 15 and under at risk of hyperactivity"
Steph!! These are too cute to be eaten!! These are amazing!! 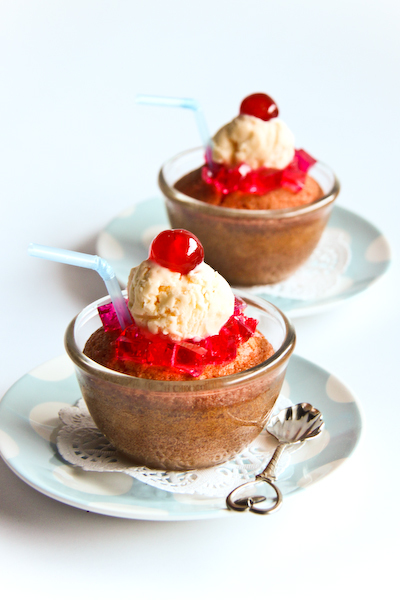 ice cream and jelly cupcakes? I would never have dreamed up this unbeatable pairing! If only I didn't have such a long list of things to bake, these would definitely be on my to do list! These are so freaking awesome! Do you realise that you can actually buy Creaming Soda jelly from Aeroplane? Not as fabulously MacGyver as your technique, I must admit, but pretty delicious nonetheless. Love the idea! Your cupcakes look so cute all dressed up like ice cream sodas :) well done! chocolatesuze - Squee! Heehee thanks! Helen (Grab Your Fork) - :) Thanks so much Helen! Ellie (Almost Bourdain) - It's so yummy! Make the jelly for her!! Abbie - Oops sorry, the comment form can sometimes be troublesome. ABBIE where were you three weeks ago, this would have been perfect! Might pick some up and try the macs again, thank you! Forager @ The Gourmet Forager - Thanks! Never say die right?? Sara @ Belly Rumbles - I've never tried the light brown one, will have to do that! Jacq - Hehe yeh I had to make it pink! Omg creaming soda ice cream would be awesome! Xiaolu @ 6 Bittersweets - thanks! Laura - Well, that's sad. It's awesome! Haha thanks..making it is really not that much more complicated than making it from a packted! billy@atablefortwo - ROFL billy! I didn't even think of that until you mentioned it! Dirty mind! Jennifurla - Hehe thank you! Simon Food Favourites - Aww shucks! Thanks Simon! OohLookBel - ME TOO! Haha thank you! Brenda - They were rather tasty :) thanks! Lisa - OMG LET'S DO IT!!! Mark @ Cafe Campana - Thanks! ROFL I agree. Though surprisingly they didn't taste that sweet! Amy @ cookbookmaniac - :) thanks amy! Cupcake Crazy Gem - Hehe ice cream and jelly make everything better! The to do list never gets shorter hey? Conor @ Hold the Beef - I did not know about that jelly flavour! I want to try some now! Gourmet Getaway - Love it love it love! You are awesome!! !